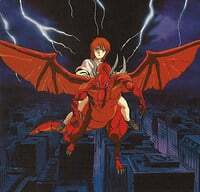 Plot Summary: Hokkaido, 1991, a series of murders take place and dragons suddenly begin appearing in the skies. The Japanese SDF begins shooting the dragons out of the sky, holding them responsible for the murders. A troubled young girl is suddenly entrusted with the care of a hatchling dragon, hoping to raise him for destruction. Everyone will soon learn who the true culprits are and why the dragons have appeared.